"Daydream Baskets" is the name I have settled on for this quilt inspired by a daybed at Windsor Castle. I think that hits the right tone -- it is a potential minefield! All three of the blocks I shared last week have gone into the reject pile. I realized that it is crucial that the centre triangle be darker than both the basket and the spikes. I also realized that five blocks would not be enough, and added another round to bring it up to thirteen blocks. Thirteen allows for a better exploration of the block and its variations, and it just seems to make more sense. Now I am debating the setting triangles. 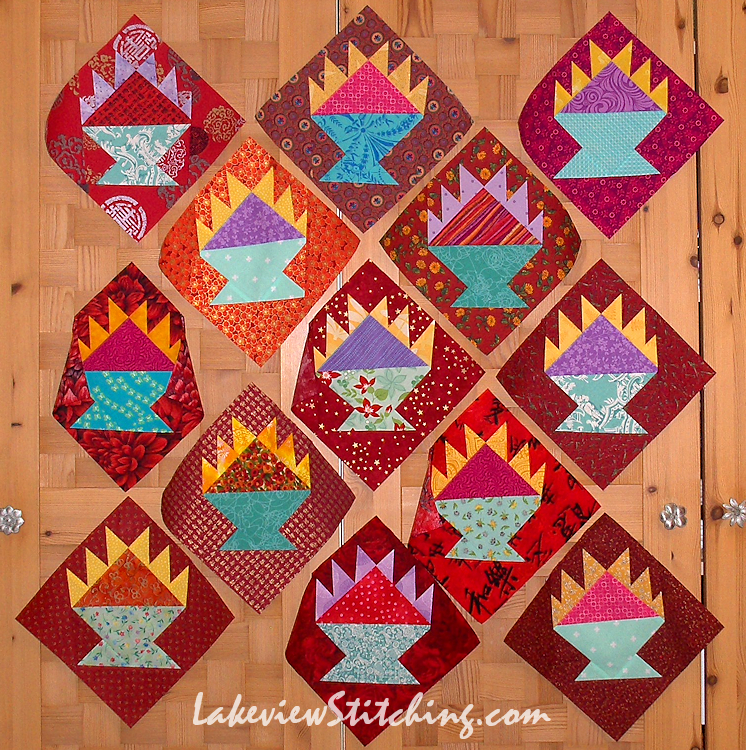 I have been thinking about sewing together the crumbs from the piecing for some "made fabric" triangles, but I'm not sure there are enough. I've also been see-sawing on the issue of sashing. But, now that I am studying the photo, I've had an idea about that. We'll see how it pans out! In the meantime, please check out the rest of the improv at AHIQ #27, right here. Oh what fun, happy baskets! I love the bright colors. Looking forward to seeing where you go with these. Thanks, Ramona! I think I have a good idea for the next step. FYI, Google is not sending me notices about your comments, so I hope I have not missed any. I certainly appreciate your visit! Delicious! I love these colors! These blocks are so beautiful. It's going to be fun to watch you progress. I like these blocks too! I hope you have enough fabrics to stitch some crumb fabric triangles as those could be a lot of fun to add. . .who says you can't have sashing too? Looking forward to the next installment! These baskets are just alive with color, looking forward to seeing how this one progresses. Such lively baskets. Perfect colors. Thanks for the pointer about the values inside the basket and for linking with AHIQ. Somehow I missed that post last week, so have come in where the number Rd isbeing honed. I love the depth of the reds and the yellows w. Once again, it’s harmonious - you do harmony so well! Well yes, eventually I get there. Thanks, Jillian! Everyone likes the reds, and I agree -- it is interesting how the mix of different reds makes it deeper than if I'd used only one fabric. These definitely work! You have managed to get things just right, so your spikes seem to glow against the deeper colours. I often see a solution when I look at a photo that I had missed looking at the actual thing - funny how that works. Oh my goodness what a wonderful color combo. Bring on the daydreams! Really, really loving these bright, vivid baskets! I love the way the spikes seem to glow against the darker backgrounds. In fact, all the colors seem to glow like a beautiful sunrise. I had to go back and look at the "reject" basket blocks to see what the difference was. They looked fine to me when you originally posted them, but these are really better. Interesting how that one small change makes such a big difference. Glued to the television here in the Midwest as the noose tightens on our Russian president. Marvelous baskets -- good luck with the next round of decision making. Oh, I love your baskets! What fun colors, and a great name. Yes, I think you did good to replace those original baskets. Funny how just a little shift in color and contrast makes such a big difference. Good luck with deciding on the sashing and setting triangles! You do have a knack for choosing good colour combinations. These are so vibrant.